Please refer to our stock # SK-2 when inquiring. Woodblock Print of Traditional Japanese Folk Potteries by Serizawa Keisuke. Issued by Nihon Mingeikan (Japan Folk Craft Museum) in 1970. H. 20"(51cm) x W. 26"(66cm.) Excellent colors, light toning to paper. Printed text in Japanese. See also SK-1 in English. Keisuke Serizawa (5/13/1895 - 4/5/1984) was designated a Ningen Kokuho (National Living Treasure) in 1956 for his work in katazome stencil dyeing. 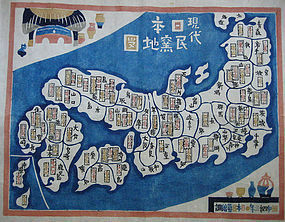 He spent considerable time studying Ryuukyuu Bingata techniques in Okinawa and this influence is apparent in his designs and color palette. He was a leading first-generation member of the Mingei (Folk Craft) Movement along with Yanagi Soetsu, Hamada Shoji, Bernard Leach, Kawai Kanjiro, and others. His printed textile and paper works are in countless public and private collections as well as two museums in Japan solely dedicated to his work; The Municipal Serizawa Keisuke Art Museum in Shizuoka, and the Serizawa Keisuke Art and Craft Museum in Sendai. He had several students who rose to their own prominence, including Yoshitoshi Mori and Watanabe Sadao.